Dr Rajesh Shah has extensive teaching experience. He was one of the youngest homeopaths who joined as visiting lecturer at CMPH Medical College, under Mumbai University in 1989. Around the same time, he started teaching in the international circuit. He conducted seminars for homeopaths as well as conventional doctors in India, UK, Holland, Belgium, Greece, Norway, Sweden, Czech Republic, Ireland, and more. In 1994, he started conducting Clinical Training Course in Homeopathy, at his clinics in Mumbai; especially for homeopaths from foreign countries. The training courses became popular among homeopaths that attended training from Germany, Sweden, USA, Canada, Italy, Japan, Croatia, Australia, South Africa, Russia, etc. The training was clinic-based involving 8-9 hours of hands-on learning daily for six days a week. Dr Shah believes in teaching which works for all homeopaths. He is against the imaginary and non-scientific approaches in homeopathy, which are floated by some teachers in the recent years. 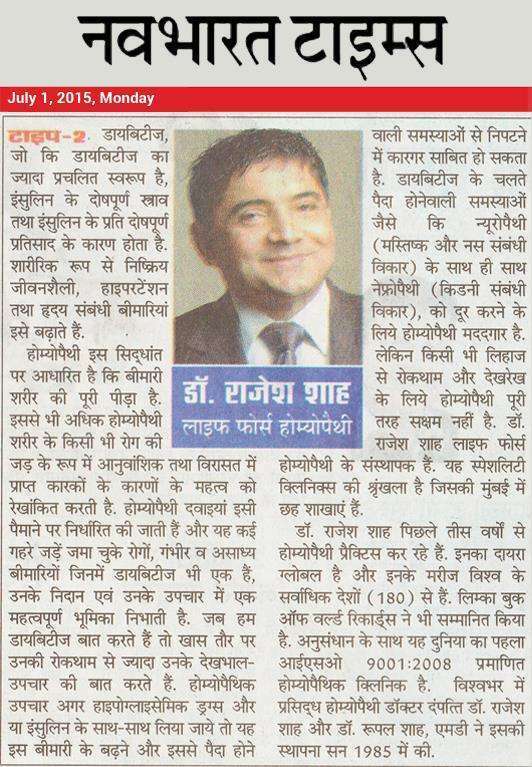 He has raised queries on the unfounded approaches in a series of editorials in Homeopathy Times, way back in 1994-95-96. His teachings are based on research in homeopathy. His involvement in new drug discovery and use of new medicines for difficult diseases form a major part of his teachings.